Unlike most of the Mojave Desert, the southwest corner (Antelope Valley) is relatively well settled - north of the San Gabriel Mountains the land is criss-crossed by a regular grid of roads, leading to scattered towns and occasional ranches, even though large areas are still completely undeveloped. 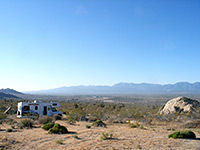 A few granite hills interrupt the general flatness, and one of the most prominent is Saddleback Butte, rising 1,000 feet above its surroundings, and which was incorporated as a state park in 1960, partly to protect the Joshua trees and the other typical Mojave Desert plants that grow on its rocky slopes. The park has a campground and picnic area but the main point of interest is the 2 mile path to the summit, which gives a fabulous 360 degree view of the valley, a panorama extending to 50 miles in some directions. The path gains 950 feet in elevation, and is just long and steep enough to present a moderate challenge, especially in the long 100°F days of summer. Most roads in Antelope Valley are dead straight, aligned north-south or east-west, and with major routes every one mile. Saddleback Butte State Park is reached by driving east from Lancaster/Palmdale or west from Victorville; the nearest (small) town is Lake Los Angeles, from where the park entrance is a 4 mile drive northwards on 170th St E. The place is not well signposted. The road is lined by a few scattered dwellings, some new but most old and ramshackle, separated by patches of empty, creosote bush desert. The park entrance track leads past the self-pay fee station (cost $6 in 2013), through a dusty, uninspiring, 27-site campground (little shade available), and on to a picnic area one mile north. The usual route to the Saddleback Butte summit is via a 2 mile trail beginning at the campground though an alternative is the Little Butte Trail from the picnic area - this first reaches a minor summit then joins the other trail at the foothills of the main peak. A third trail, intended for horses, skirts the west and north edges of the butte. For free camping hereabouts, one good location is near the west side of Alpine Butte, accessed by a sandy track (125th St) that branches north off Avenue O and passes plenty of clean, sandy sites next to granite boulders, with fine long distance views. From the campground, the Saddleback Butte Trail heads eastwards towards the peak, crossing flat desert at first, over a surface of soft sand that makes the walk a little more tiring than might be expected. 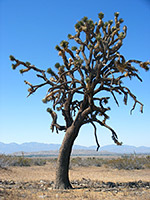 The vegetation consists of straggly bushes, a few cholla cacti and many large, isolated Joshua trees in good condition - some grow up to 40 feet high and have dozens of branches. The land stays level until the junction with the Little Butte Trail at a fence; after this the route starts to climb and the sand becomes coarser and more firm underfoot. The trail bends to the right as the foothills approach, the gradient increases, and the sand is replaced by granite outcrops; it soon arrives at the top of a saddle, allowing the first views of empty desert to the east, on the far side of the butte. The final quarter of a mile is along the ridge northwards to the 3,651 foot summit, marked by a USGS plaque and an unofficial trail register (in a tin behind a large boulder) maintained by a local resident. 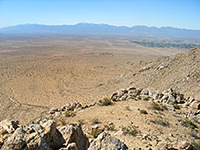 A few lesser peaks to the north and south hide a small part of the surroundings but the remainder is in full view - features visible (clockwise from the west) include the Tehachapi Mountains, Rogers Lake, Adobe Mountain, the Shadow Mountains, the San Bernardino Mountains and the San Gabriel Mountains; see panorama. The vista is certainly very good, just rather hazy owing to the great distances, and vestiges of the Los Angeles smog. The round trip takes about 2 hours, a journey taken only by one or two groups each day in summer, judging by the entries in the trail register. The closest towns with hotels near Saddleback Butte State Park are Adelanto (25 miles), Cajon Pass (38 miles), Lancaster (18 miles) and Palmdale (24 miles).